Sometimes a lower league side can get lucky in cup upsets against higher level opposition, scoring a fluky goal from one attack, clinging on for dear life as time slowly ticks away, but not this time, not by any stretch of the imagination. A reinvigorated Luton Town may well have fallen behind on 13 minutes to Jordan Ayew’s scrappy strike, but once they found their groove midway through the half, boy were they good, seriously good. Snapping into their tackles, playing some wonderful football, no better than the move that led to Jake Gray’s first goal for the club, Hatters dominated their opponents, who had been plying their trade in the Premier League this time last term. The telling moment came in the final 10 minutes, as usually when leading against a team from the higher echelons, there would be wolf whistles from home fans, with nails bitten to the quick, but not this time, no chance. In fact, Town fans were lapping it up, with Kenilworth Road bouncing, witnessing their side outplay a Villa team that had started with £12m Ross McCormack, ending the game with likes of established top flight players likes of Micah Richards, Alan Hutton and Rudy Gestede in their ranks. On the back of a marvellous 3-0 win over Plymouth on Saturday, Luton made three changes to their side, handing a full debut to teenager James Justin in place of the suspended Dan Potts at left back. Jake Gray was given his first start after signing from Crystal Palace earlier this month, in place of Jordan Cook, while Glen Rea dropped back to centre half to partner Johnny Mullins, with Scott Cuthbert remaining on the bench, despite his starring role at Plymouth on Saturday, as Olly Lee came in. It looked like Hatters had been caught cold by their opponents, as Villa dominated possession, coming within inches of taking the lead on nine minutes when Nathan Baker found space and saw his cross was sliced on to his own bar by Rea, with Justin nipping in to clear the danger. 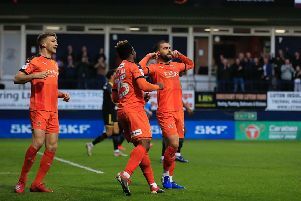 Luton had their first real opportunity as Stephen O’Donnell speared a ball wide to Pelly-Ruddock Mpanzu, who fed Jack Marriott and off-balance, he fired across goal. The visitors were denied by the woodwork once more on 11 minutes, when Jack Grealish let fly from 20 yards, his drive hitting the inside of the post, Christian Walton well beaten. Roberto De Matteo’s side were finally rewarded for their efforts two minutes afterwards, when a corner into the box was never dealt with by Town’s ponderous defence and Ayew spun to see his shot dribble into the bottom corner. Ayew was off target once more as the hosts impressed when going forward, their slick passing leading to more than one overload on the right hand side, with O’Donnell doing well twice to clear the danger from the lurking McCormack. Walton showed exemplary handling to smother Grealish’s low free kick, but there were signs of life from the hosts, as they had started to to get to grips with proceedings. They levelled on 36 minutes too, with a marvellous goal as Marriott and Cameron McGeehan combined, with Mpanzu then taking over, slipping in a beautiful through ball for Gray, who finished with aplomb over the advancing Mark Bunn. The Villa keeper stuck out a glove to parry Marriott’s deflected cross shot away from his net, as Luton finished the half strongly, with Mpanzu in particular a real driving force from midfield. After the break, Town almost got off to the perfect start as Danny Hylton found space in the area, but taking an age to shoot, allowed the Villans back-line to block, while Marriott’s follow-up was kicked off the line. Mpanzu, who was becoming more of a force with every passing moment, strong and powerful in possession, then played a wonderful through ball to Marriott, who couldn’t untangle his feet in time. With Town bombing forward at every chance, they deservedly reaped the rewards for their all action approach on 53 minutes. McGeehan played through Pelly as the midfielder was denied by Bunn, the keeper also blocking Marriott’s follow-up, only to inadvertantly deflect into McGeehan’s path for a simple tap-in. Town then were thankful to their crossbar for the third time as from a corner, a loose ball rebounded off the woodwork once more, before Hatters were quickly on the front foot once more. Bunn pawed away from Hylton’s as Town were in dreamland again on 67 minutes, when Lee’s cross from the left was comically turned into his own net by the cumbersome Jores Okore whose evening was quickly turning from bad to worse. With Villa now looking every inch a side who hadn’t won since February, the margin of victory could have got even bigger, Bunn denying Marriott with a wonderful low save. Rather than have to withstand their opponents throwing everything at them late on, Luton always looked in control too, restricting their illustrious opponents to shots from range through Grealish and Ayew, as they earned a home tie in round two against another Championship side, in Leeds United. Hatters: Christian Walton, Stephen O’Donnell, James Justin, Johnny Mullins, Glen Rea, Olly Lee (Scott Cuthbert 84), Pelly-Ruddock Mpanzu, Jake Gray (Jonathan Smith 88), Cameron McGeehan, Danny Hylton, Jack Marriott (Isaac Vassell 90). Subs not used: Craig King, Josh McQuoid, Akin Famewo, Jordan Cook. Villa: Mark Bunn, Nathan Baker (Alan Hutton 46), Micah Richards (C), Jores Okore, Aaron Tshibola, Jordan Ayew, Andre Green, Gary Gardner, Jordan Amavi, Jack Grealish, Ross McCormack (Rudy Gestede 46). Subs: Tommy Elphick, Leandro Bacuna, Jed Steer, Ashley Westwood, Aly Cissokho. Bookings: McCormack 17, Ayew 43, Gardner 71, Lee 79.